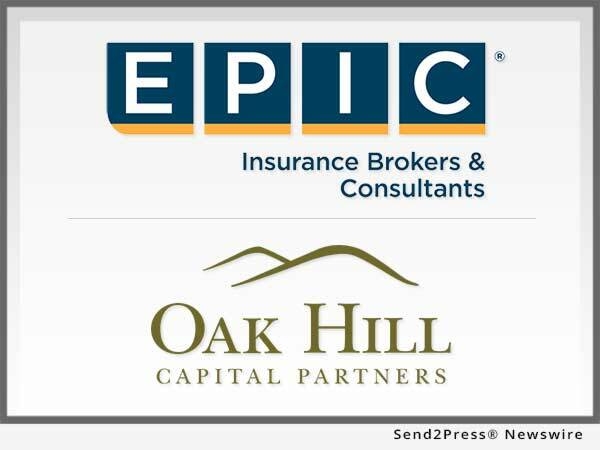 SAN FRANCISCO, Calif., Jul 27, 2017 (SEND2PRESS NEWSWIRE) — EPIC Insurance Brokers & Consultants, a retail property, casualty insurance brokerage, and employee benefits consultant, announced today that private equity firm Oak Hill Capital Partners (Oak Hill) has agreed to acquire all of The Carlyle Group’s stake, giving Oak Hill a controlling equity position in EPIC. Oak Hill’s investment will enable EPIC to continue its aggressive organic growth strategy and will support strategic acquisitions of additional complementary insurance distribution platforms across the United States. Oak Hill is a private equity firm managing funds with more than $10 billion of initial capital commitments since inception from leading global endowments and foundations, public and corporate pension plans, sovereign wealth funds, insurance companies, financial institutions, consultants, and family offices. Over the past 30 years, the professionals at Oak Hill and its predecessors have invested in 84 significant private equity transactions across broad segments of the U.S. and global economies. Oak Hill applies an industry-focused, theme-based approach to investing in the following sectors: Consumer, Retail & Distribution; Industrials; Media & Communications; and Services. Oak Hill works actively in partnership with management to implement strategic and operational initiatives to create franchise value.